SAMS Odisha Key Dates for +2 e-Admission 2019 - +2 admission 2018 Odisha Key dates will be declared by Department of Higher Education, Govt. of Odisha. Students can view the Key dates below in this post. 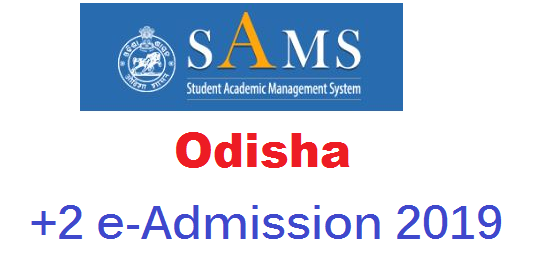 Students can apply for +2 e-Admission 2019 Odisha through the Students Academic Management System (SAMS). Students can apply online for +2 admissions through Common Application Form (CAF) which is available at www.dheodisha.gov.in or www.samsodisha.gov.in. +2 e-Admission 2019 Odisha applications will be made through online or offline and the application forms will be available at SAMS Odisha official website or SAMS Resource Centers. Now Key Dates for +2 Admission 2019 Odisha not be declared yet by Department of Higher Education, Odisha. After the declaration of Key dates, it will be displayed at SAMS Odisha portal. Students can apply for Odisha +2 Admission 2019 Odisha for various colleges in Odisha like Government colleges, private colleges or government-aided colleges. After the declaration of Odisha 10th result 2019, the Odisha +2 e-Admission 2019 process will be started and the key dates for+2 e-admission and students can get all details like how to fill online form, how to get the offline form, the applicable date or application file last date etc,. Students who are successful can apply for the +2 e-Admission 2019 Odisha, who are failed in HSC exam they cannot fill the application form for +2 colleges in Odisha. We will update the same in this post when the Key dates for +2 e-Admission 2019 Odisha will be available at the official website of SAMS Odisha portal or DHE Odisha website. After the availability of updating Key dates for Odisha +2 Admission 2019 on the SAMS Portal, I will update the same in this post as such please keep regular visit. You should visit the official website of SAMS Odisha or below link. Here on the homepage, you find the New Registration link. Enter OTP which you will get in your registered mobile. Fill captcha code and Click on submit button. You will get Registration no with the password will be available on your mobile. Next, In login the page Registration process, you log in with your credential. Fill application form correctly and submit button. Take a print out copy of confirmation page and submit at SAMS Center. I hope you like this post and if you have any problem to know the key dates of +2 e-Admission 2019 Odisha please leave a comment in below comment box. Please stay touch with this post for more updates for +2 e-Admission 2019 Odisha Key dates.